The No. 1 factor in serious highway accidents continues to be alcohol. Despite countless warnings, drivers still start their cars knowing that the chances of causing another person harm are high. Because driving under the influence was more important to these people than the safety of others, California courts allow juries to levy punitive damages in drunk driving accident cases, to send the word out that injuries caused by DUI actions will not be tolerated. Without punitive damages, people who cause serious injuries could simply say, “But I was drunk. I had no intention of hurting anyone.” California law doesn’t allow that as a defense. The effect of punitive damages is often to double or triple the total damages, above and beyond medical costs, lost wages, and pain and suffering. Our attorneys also file claims against tavern owners and party hosts who allow obviously intoxicated guests to drive away, with the clear possibility of causing serious injury. Were you injured because another driver was intoxicated or high? 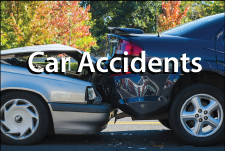 Call the Orange County personal injury law firm that will stand by you. Call Chambers & Noronha at our Santa Ana office at 714-558-1400 with questions — or ask our lawyers by email.